New CivilFEM 2016 Release | TechLead Solutions Pvt. Ltd.
Madrid, Spain–(April 1, 2016) – MSC Software Corporation and Ingeciber S.A., a specialized civil engineering CAE company with more than 30 years of experience in civil engineering today announced the new release of CivilFEM® 2016, powered by Marc® . CivilFEM 2016 is a unique simulation solution that provides sophisticated system-level structural simulations of large singular buildings, bridges, tunnels, nuclear power plants, and other structures. Miguel Angel Moreno, CEO of Ingeciber, said “Non-linear analyses are becoming more frequent in civil engineering area and CivilFEM 2016 provides the structural engineer with the ability to solve more non-linear complex analyses in a simple and comprehensible way”. The new release uses a completely revamped graphics engine, the performance has been improved greatly while new interface features have been added: new selection filters, separated and selectable geometry and structural element views, grid improvements, drag and drop selection boxes, improved visualization of loads and masses, to name a few. A powerful grouping system has been implemented allowing the creation of entity groups that grants the organization of the model in higher level entities for fast selection and group operation. Several pre-processing new capabilities have been included such as the ability to reverse mesh element orientation, direct node interaction allowing the engineer to apply loads and masses on nodes, new cable, springs and connection modeling among others. The meshing process has been optimized giving a 50% speed improvement, giving a more fluid interaction with the model. Several advanced features have been added, such as the Cam-Clay soil model, new Python commands for node interaction and post processing and segment to segment contact algorithm. The combination of these features is unique to CivilFEM, making it the stat-of-the-art solution for Civil Engineering. Download the Release Notes for more information. 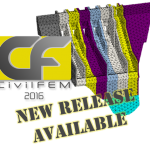 CivilFEM 2016, powered by MSC Software’s Marc nonlinear FEA solution, is available exclusively from Ingeciber and its distributors worldwide. For more details about the new release, please visit CivilFEM website. Ingeciber is a CAE specialized company developer of CivilFEM and supplier of simulation software from international global leaders and related services like technical training, support and consulting. As a pioneer CAE company Ingeciber technologies are used by a wide range of worldwide companies, academic and professionals. For additional information please visit: www.civilfem.com andwww.ingeciber.com.